After losing to Syracuse but defeating unbeaten Virginia, has Duke done enough to keep their #1 spot in the AP Top 25? Who can, if anyone, overtake Duke? For just the fourth time in college basketball history, the number one team in the AP Top 25 (Duke) took on the number one team in the Coaches Poll (Virginia) at Cameron Indoor Stadium. 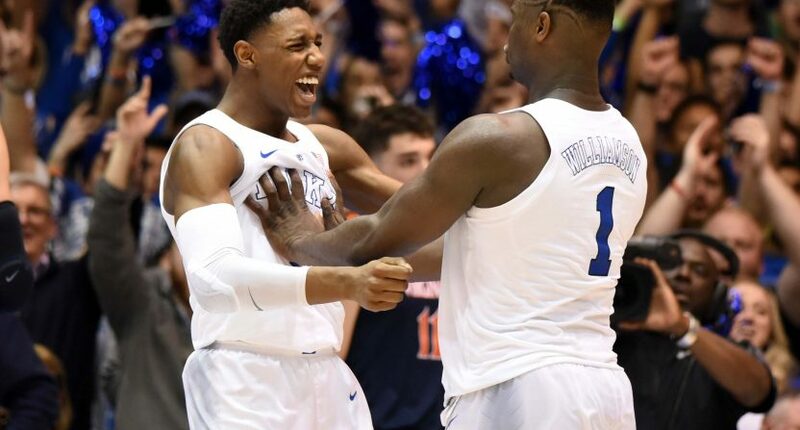 In the end of a very close game throughout, it was the Blue Devils who broke out to a late lead and held off the Cavaliers 72-70. Saturday alone changed the college basketball landscape. The two remaining undefeated teams lost on the same day (Michigan lost 66-56 to Wisconsin) and top 10 teams, Kansas and Texas Tech, also lost. Having said that, the question needs to be asked. Despite losing to Syracuse on Monday, does beating Virginia do enough for Duke to keep their top spot in the AP Top 25? Among the top five, it’s safe to say Michigan (No. 2) won’t be because they lost and Gonzaga (No. 5) probably won’t be able to close the gap with the opponents they had. This leaves three potential teams who could take the number one spot. The first is obviously Duke. Duke lost Monday night at home to unranked Syracuse and dropped to 15-2. But they also defeated the final unbeaten team in Virginia so that very well can even out. The team closest to Duke is Tennessee. The third ranked Volunteers wouldn’t need to move up all that much to catch Duke. Plus, Tennessee’s only loss came at the hands of then second ranked Kansas at the start of the season. Despite losing to Duke, Virginia has a big win against a top 10 team this week. They destroyed No. 9 Virginia Tech by 22 on Tuesday. But despite the nice win, it’s tough to imagine Virginia moving up from four to one and passing the team who just beat them. So when it comes to Duke and Tennessee, who is getting the top spot? Both teams would deserve number one but if I had to choose, I’d put my money on Duke. Over the past month, Duke faced three top 15 teams and defeated all three. Tennessee has only played two top 25 teams all season and despite defeating then top ranked Gonzaga, one was the Kansas loss. Despite the recent loss, Duke has the better resumé, they should be number one. But Duke will need to work hard to keep that for the rest of the season.